Every four minutes a photovoltaic system is installed in the U.S. Recently emerging solar technologies can help reduce greenhouse gas emissions as well as reduce U.S dependency on foreign countries for energy supply. However, before solar technology can become ubiquitous throughout the states, some hurdles have to be overcome. Roadblocks for solar technology include creating panels that are more efficient, determining how to efficiently store energy generated from solar panels, efficiently converting solar energy from AC to DC, and reducing the installation costs of solar panels. Government agencies, universities, and private enterprises are all working vigilantly to turn these barriers into bridges and poise solar energy to become a predominant energy source in the world. Presently, most solar panels convert less than 20% of the energy from sunlight into electricity. Increasing the efficiency of solar panels is one of the most direct ways to ensure that this technology gains traction. Companies involved in the research and development of more efficient solar technologies are eligible for substantial R&D Tax Credits. Companies involved in the development, manufacturing, and installation of solar technologies can potentially offset high R&D costs by utilizing the R&D Tax Credit. The majority of solar panels today are made up of one semiconductor material, usually silicon. Using one kind of semiconductor material only allows certain frequencies of light to be converted into electricity causing other frequencies of light hitting the panel to be lost as heat. Researchers at Caltech Institute of Technology are working on increasing the efficiency of solar panels by creating precisely structured materials, which are able to sort sunlight into ten different colors. Once the light is divided into its various colors, the light can then be directed at solar cells with semiconductors that are designed specifically to convert the particular color of light coming in, into electricity. This process greatly increases efficiency and electricity generation. This technique of sorting light into different frequencies is not new but in recent years, there have been breakthroughs in manipulating, sorting, and guiding light. Using light separation, solar panels can be expected to convert 50% or more of the energy from sunlight into electricity. Nanotechnology has the potential to revolutionize solar cells. One of the most beneficial aspects of nanotechnology in the manufacturing of solar PV cells is the cost savings. Less energy is consumed in the production of nanoparticle solar cells than in the construction of conventional PV cells made from crystalline semiconductor material, which uses a high-temperature vacuum process. Nanoparticle PV systems are also less costly to install due to their lightness and ability to be produced in flexible rolls. The installation of these soft rolls does not require the need of expensive metal mounting systems and supporting tools. 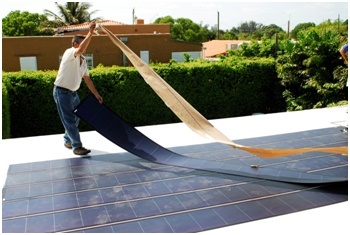 Conventional rigid PV systems use panels that come in large rectangles and when wind blows at high velocities, these panels can be ripped off roofs if they are not anchored properly. Currently, nanotechnology solar cells are not as efficient as other solar technologies, however the cost savings of nanotechnology can offset this lack of efficiency. Carbon nanotubes (CNTs) will allow for lighter, flexible, and less expensive solar cells. CNTs have been deemed a promising material to construct solar cells from, but the technology has proved to be inefficient compared to silicon solar cells. Recently, a research team at Northwestern University’s McCormick School of Engineering has developed a new type of solar cell that is twice as efficient as earlier CNT solar cells. This was accomplished by altering the CNT’s chirality, which is an amalgamation of the carbon tube’s diameter and twist. Previously CNTs were constructed using one kind of chirality; the only issue with this approach is that each chirality only absorbs a narrow range of the light spectrum coming in. The new approach in the design of CNT panels is to use multiple chilarities; this has allowed for a broader range of frequencies to be absorbed by the panel. New polychiral CNT panels developed by Northwestern have been able to absorb near-infrared wavelengths, a capability that many leading thin-film technologies lack. CNT technology still lags behind silicon PV panels, but CNT panels have the advantage of being less expensive to manufacture. The end goal of CNT technology is to develop panels capable of converting every photon from the sun and converting it into electricity. Perovskite has unique properties that are being tested in solar panel design. It has the potential to replace silicon as the primary material used in solar panel construction due to its ability to be made into layers 1,000 times thinner than a human hair. It can also be tinted different colors and applied to flexible films. All these characteristics make perovskite an ideal material to be integrated into special coatings that can act as paint. This would allow the sidings of buildings as well as many other surfaces to be potential sites for solar energy production. The Massachusetts Institute of Technology is pursuing ways to make solar technology more efficient. Their most recent breakthrough involves advances on the quantum level. At approximately 9% efficiency, MIT has set a new record efficiency for quantum-dot-cells. Quantum dots cells use a matrix of finely tuned crystals that are tuned to specific frequencies of the light spectrum. The major advantage of quantum dots is that they are capable of exciting as many as seven electrons from each passing photon in light. This is far more efficient than silicon panels, which are only capable of exciting one electron from each passing photon of light. This 9% may seem trivial but what makes quantum dot cell panels so attractive is that they are inexpensive to manufacture and they are highly adaptable. In addition, silicon technology has had six decades to reach its current level of efficiency and still has not achieved its theoretical efficiency. Quantum dot cells are a new technology and have only been around for four years, making 9% efficiency a major accomplishment. Michigan University has teamed up with Queen’s University in Canada to take a different approach to increasing the efficiency of solar cells. Instead of increasing the effectiveness of the panel itself, they are going further up the energy food chain to improve efficiency. The goal is to get more light to shine on solar panels. The increased light will allow the solar panel to convert more light into electricity. When flat-faced solar panels are installed for a large-scale system, they are spaced apart to prevent shading. As the sun shines on the PV system, a large amount of potential energy is lost due to the light hitting those spaces. By installing reflective material in the spaces in between the rows, light can be reflected back onto the panel. This solution may sound simple, however forcing solar panels to receive more light than they were designed for will cause the panels to work harder and reduce their lifespan. Another unintended consequence of increasing the amount of light that hits a solar panel is that this light heats up the panel and reduces the panel’s efficiency. Many people may think the hotter and sunnier it is, the more electricity a solar panel will generate, but this is not the case. The drop off in efficiency for solar panels due to heat begins at about 87 to 91 degrees Fahrenheit. Researchers at Michigan and Queen’s University are using mathematical analysis to reduce the risks associated with bi-directional reflectance function. Through their analysis, they were able to strategically place reflectors to increase the efficiency of a solar farm. They were able to increase the effectiveness of the panels by 45% and simulations showed that efficiencies could be increased by another 30% if better reflectors were used. Cornell is heavily researching the chemistry behind solar cell design by layering thin films of organic-inorganic metal halide perovskite onto silicon to increase efficiency. The process of developing new PV material starts with the development of a solution of organic and inorganic molecules. The solution then must be refined so that it can be smooth and defect free. Labs around the world are finding it difficult to develop a defect-free perovskite, however, Cornell researchers have accomplished near-perfect solar cells using non-halide lead acetate. One of the major advantages of using this new liquid source is that it can be easily applied using a simple solution coating. Yale is conducting research that promises to significantly increase the efficiency of polymer solar cells. Dr. Andre Taylor’s Transformation Materials & Devices Lab at Yale has developed a polymer solar cell that performed 22.5% better than standard organic solar cells. In their lab, they were able to reach conversion efficiencies of 8.7%. Researchers used a technique known as solvent vapor annealing (SVA) which chemically modifies the properties of the polymers to align better than conventional thermal annealing (in which heat used during the process reduces the performance of the polymers). Recently, the U.S. Army has obtained a patent for the development of a tiny photovoltaic solar cell. 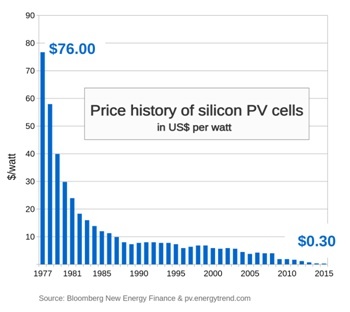 The new cell is significantly smaller and cheaper to manufacture than current solar cells. The army is developing these economical, compact, flexible, and efficient solar cells to be installed on all sorts of military equipment to power remote equipment that may have to operate in inaccessible areas. The army is also looking into ways to overcome wear out, damage, and stress-induced to PV structures due to heat. The use of artificial intelligence (AI) to solve everyday problems is gaining serious traction in all industries including the solar industry. AI is starting to be used to model, analyze, and predict the performance of solar energy projects. To design solar systems with the highest efficiencies, it is necessary to collect and analyze metrological, solar radiation, temperature, and wind data from the area where the projected solar project will be constructed. Unfortunately, these kinds of data sets may not be available, may be of poor quality, or does not encompass a sufficient time span. AI can be used to fill in these gaps more accurately. One of the major downfalls of solar power is its intermittency. Artificial intelligence can help reduce the uncertainty associated with this intermittency and be an essential tool to integrate solar technology into the grid at scale. Artificial intelligence in the future will allow utility companies to more accurately predict days where solar energy will not produce enough to meet demand. In these instances, utility companies can take action to ensure enough energy is produced through other means, in order to meet demand. Historically, one of the biggest factors preventing solar panels from being ubiquitous has been their intermittent nature. Being able to generate electricity at night is an obvious problem, but cloudy or snowy days are also primary concerns. This inability to continuously generate electricity has forced facilities that use solar panels to be tied into the grid or to be hooked up to a battery bank. Both these options add to the cost of installing a PV system and therefore the cost per watt for installation. This is becoming less of a concern with the development of new battery technologies that increase efficiency while at the same time reduce the cost of manufacturing. Products like the Tesla Powerwall are not only allowing homeowners to store power more economically than ever before, they are also providing a turnkey solution that makes solar technology more appealing to prospective consumers. Power inverter technology is another aspect of photovoltaic system design that is getting recognition. Companies like Google, who constantly have their eyes focused on the horizon, understand that development of power inverters will be essential in increasing solar system efficiency. In 2014, Google announced a $1 million competition to generate new ideas and innovations that will spur the next generation of solar power inverters. Sunlight energy is converted into electricity in the form of Direct Current (DC). Homes that are tied into the grid rely on Alternating Current (AC); this is why it becomes necessary to use a power inverter to turn the DC current into AC. However, during this conversion process energy is lost due to the inefficiency of power inverters. 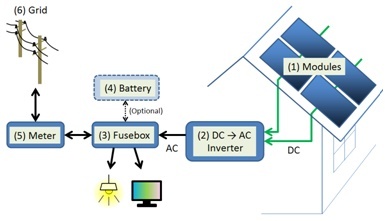 Most solar inverters are 95% efficient, however some systems can become highly inefficient if an inappropriate power inverter system type is put in place This 5% efficiency gap may not seem like a big deal, but when extrapolated over a year for a large-scale system, the number of watts can quickly add up. Increasing efficiency of all elements of PV systems allows steady increases in efficiency without the need for a major breakthrough in one particular technology, which can be harder to come by. Solar technologies are evolving rapidly. This industry is expected to grow tremendously in the next ten years. Companies that are involved in the development, manufacturing, and installation of solar technologies can offset high R&D costs by utilizing the federal R&D Tax credit. Many firms incorporate the credit into their business model and use the savings as a way to fund future research and process improvement.